Manufacturing has been a key component in Redmond’s economic turnaround. For years a timber, agriculture and construction town, Redmond is sporting a new identity to the state, the country and even the world. Although new businesses of all sorts are moving into the area, the most exciting economic development today is the heightened interest in manufacturing plants that are finding permanent homes in Redmond. At the beginning of the economic recession in 2008, 30 percent of Redmond’s manufacturing buildings were sitting empty. Today, that vacancy rate stands at just 15 percent – a rate that’s dropping quickly, according to Jon Stark, manager of Redmond Economic Development, Inc. (REDI), a local nonprofit organization focused on diversifying Redmond’s industry mix. 1. Manufacturing companies provide much-needed jobs for residents in and around Redmond. As a small city, Redmond is home to a number of small businesses that employ just one to five people. In contrast, BasX Solutions, a plant that will produce modular hospital and power storage unites, has revealed plans to hire up to 150 people over the next two years of operation. Another such company, Consumer Cellular, which absorbed many employees from the former T-Mobile call center, has hired nearly 500 employees since 2012. 2. Manufacturing plants make it possible for households to earn healthy incomes. A vigorous, economically prosperous community needs jobs that pay more than minimum wage. The reason: so its people can afford to purchase homes in the area while still enjoying a quality, comfortable lifestyle. According to Stark, one of REDI’s objectives is to help increase the number of family-wage jobs in the community. Redmond houses manufacturing plants such as internationally acclaimed PCC Schlosser, which joins other area manufacturers in offering competitive salaries for its employees. PCC Schlosser uses titanium castings for an array of applications, from aircraft engines to knee replacements. 3. These businesses bring diversity to Redmond. When people consider moving to and living in Redmond, they want assurance that the community is well balanced, well-rounded and accommodating to innovative businesses. In this respect, Redmond has achieved growing levels of success. 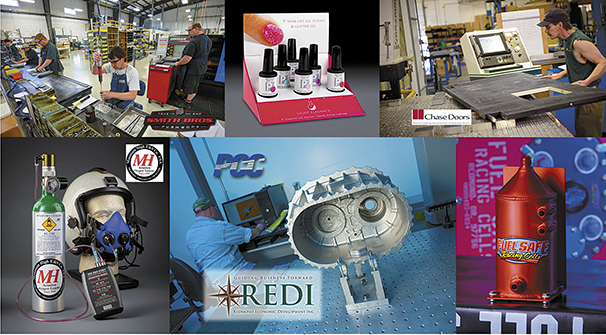 The city is currently home to a variety of manufacturing companies including those in the fields of bioscience, aviation/aerospace, specialty and food, building products, and office/administration. One such success story in the food manufacturing industry – a company that’s growing by leaps and bounds – is Straw Propeller Gourmet Foods. Within its second year of business, sales at Straw Propeller increased by 500 percent, according to co-owner Patricia Bartelson. Currently, the company produces at least 32,000 containers of product (12 varieties of oatmeal and three flavors of muesli) each month. 4. Manufacturing facilities in Redmond offer tremendous international credibility and recognition. By having a global presence in the manufacturing industry, Redmond maintains worldwide connections that keep it at the forefront of the latest technologies in various fields of manufacturing. Companies like Key Technology, a manufacturer that assembles various types of conveyer systems for food processing, has established locations in several countries including Australia, Mexico and Belgium. Diversity such as this helps, Stark says, and provides Redmond some insulation from future downturns as products are distributed over broader multi-national economies. 5. A wealth of manufacturing opportunities often leads to increased educational opportunities. This fall, Central Oregon Community College (COCC) will open its Technology Education Center. At the center, students will learn the skills necessary to work at and excel within the variety of manufacturing and technology jobs available in Redmond. Such opportunities also exist at Redmond High School (RHS), which established a new technology and manufacturing program thanks to a Career and Technical Education (CTE) Revitalization Grant. “Redmond High School looks forward to partnering with our community to offer our students a path to a high-paying job in a fast-growing segment of industry,” said RHS Principal Dr. Nicole MacTavish. In 2012, Oregon experienced a 3.95 percent growth in its gross domestic product (GDP). This represented the third-best growth in the country, according to the Real GDP Growth 2014 listing of states released by the U.S. Bureau of Economic Analysis. (North Dakota and Texas were the top two states.) A portion of this success can most certainly be attributed to the recent growth in Redmond. Several local leaders have recognized the manufacturing competencies on which Redmond continues to build. In fact, Redmond Mayor George Endicott has suggested that Redmond is a “manufacturing hub” of the region – a contention that the numbers support. Home to about one-quarter of the manufacturing jobs in Deschutes County, Redmond has worked its way into a prominent spot on both the national and international economic maps.